The Oversized Fire Dragon Bowie w/ Table Stand features a blade crafted to bring forth all the fire and fury of a dragon"s flame! 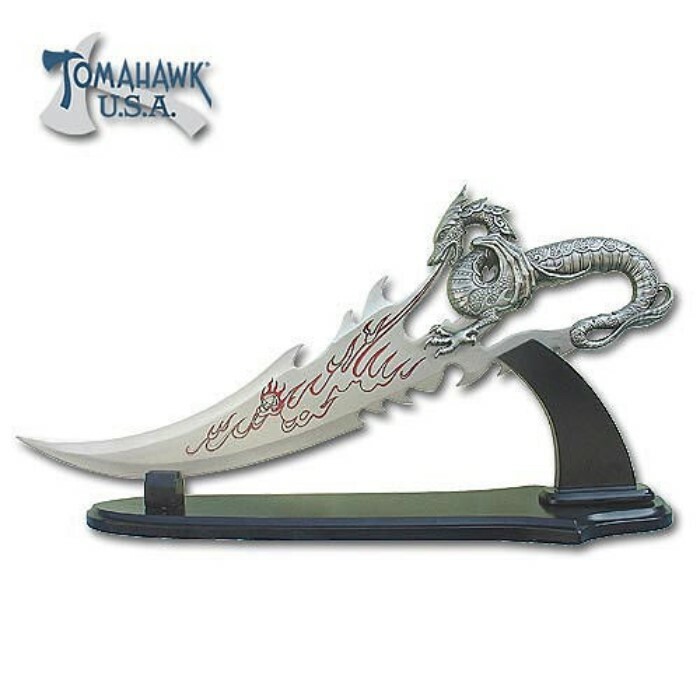 The 17 3/4" fire-shaped blade is 440 stainless steel with an etched red flame design. The cast metal handle is incredibly shaped into a dragon belching flame. This spectacular fantasy piece measures 21 1/2" overall and includes a hardwood display stand. This is a very nice piece considering the price. The detail in the cast metal dragon is beautiful, much nicer and more detailed than what can be seen in the photo. I loved the flames etched in the blade as well. A beautiful display piece. My only negative is that the blade seems rather two dimensional like it was stamped out of a thick piece of sheet metal. Some additional thickness and shape would have made this perfect. Since it's obviously intended for display (not that I don't take it out to play with it!) I still give it 5 stars, and I'd recommend it to any collector. P.S. It's huge for a dagger!